I think many people very scared to eat this because it look fat.It is my favorite.The skin is the best part.hehe..This recipe is from grandfather.Lucky my mother have learn from him.If not today i can't have this homemade steamed yam and pork belly.The one bought at restaurant not so traditional.Some they using grilled pork.Every year after Chinese New Year my mother will make this because it time to harvest the yam. 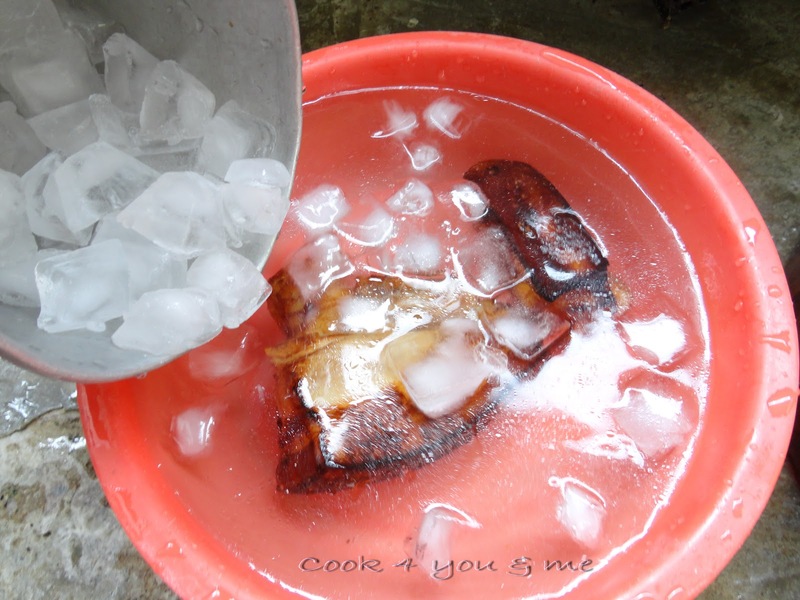 Cook pork belly in the water for 20 minutes,remove and soak in the cold water.Dish out and pat-dry,prick holes over the pork skin.Rup pork skin with light soy sauce and dark soy sauce.Deep fry in the hot oil over high heat until golden brown.Remove from heat,soak in the ice water.Drain well.Cut into thick slices. 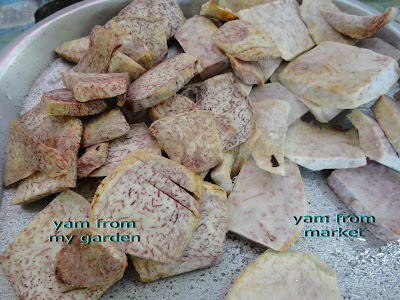 Peel yam and cut into slices as thick as pork belly pieces.Deep fry in hot oil until golden brown.Drain well. Heat up a wok and put oil and all the seasoning.Then put some water and let it simmer for 5 minutes. Put back the sliced pork belly in the seasoning mixture and let it simmer for 20 mintures. 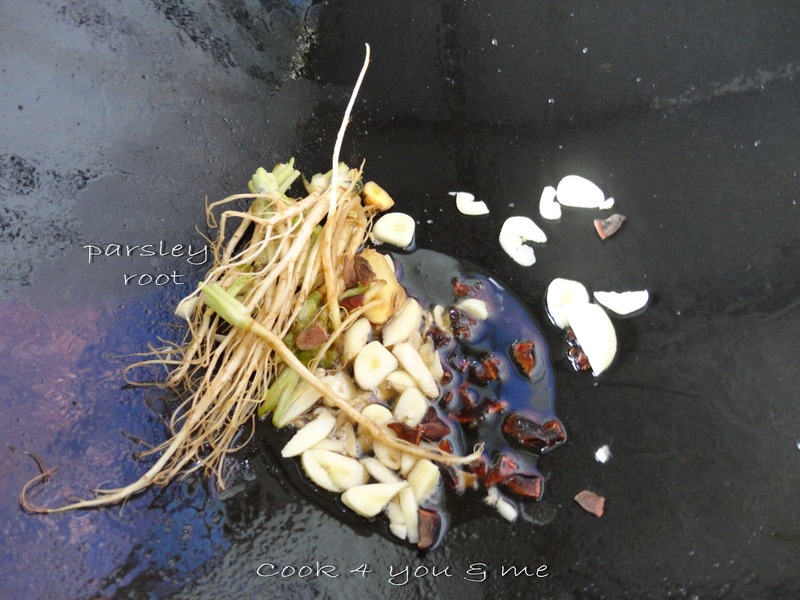 ﻿Dish out the pork belly from sauce mixture.Arrange pork belly and yam in a bowl. 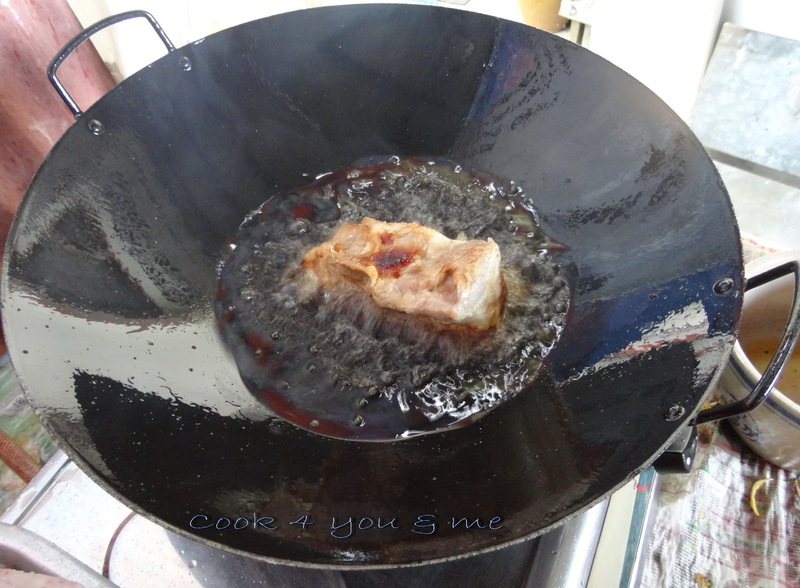 (i using rice bowl).Top with the remaining sauce.Steam in the boiling water over high heat for 30-40 minutes. Ur yam is very purple leh. Nice! 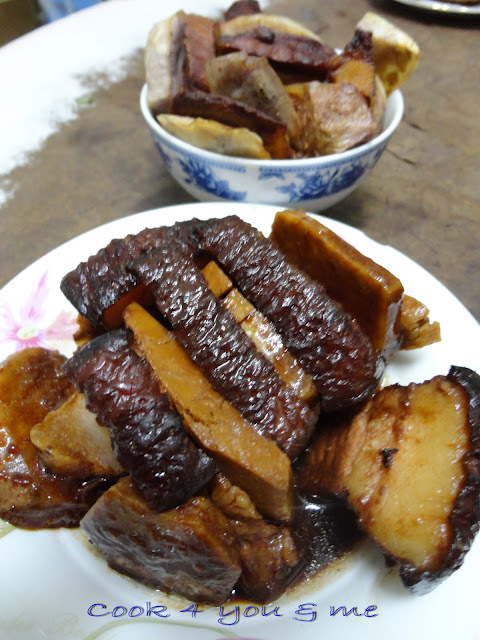 The one with roasted pork is called "Yun Kao", and not Kao Yoke. That's what I was taught from my China-mari grandaunt. But ppl tend to mix up everything nowadays, so, don't blame the restaurants, LOL. Wah.. I want ler. But I think my hubby's aunt also has some, just start to plant only. Maybe she can gimme some later, kakakakaka. Even restaurant dong po pork is not the same as traditional one. The chefs themselves may not even know the difference. Sometimes they only learn what their sifu teach them only ma, and who their sifu learn from.. hahhaa...only they themselves know. The yun kao is pronounced like "round" kao.